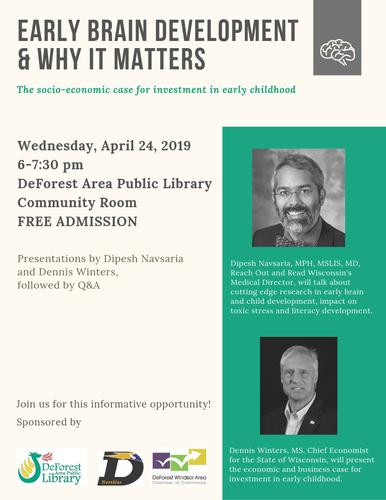 Come and listen to presentations by Dipesh Navsaria, Reach Out and Read Wisconsin's Medical Director, will talk about cutting edge research in early brain development and child development, impact on toxic stress and literacy development. Dennis Winters, MS, Chief Economist of State of Wisconsin, will present the economic and business case for investment in early childhood. Join us for this informative opportunity!